Here is some information about the pujas we practise together at the Centre. Everyone welcome, no booking required, just walk in. Free of charge. This is our daily prayer practice through which we can purify negativity, accumulate merit and receive blessings, and attain a very special compassion, wisdom and spiritual strength. By relying upon the Dharma Protector Dorje Shugden we can overcome obstacles to our practice and create favourable conditions so that we can nurture and increase our spiritual realizations. Tara is a female Buddha, a manifestation of the ultimate wisdom of all the Buddhas. Her name means ‘Rescuer’ because she rescues us from all outer and inner fears. Ultimately she rescues us from all suffering and guides us to full enlightenment. Like a mother she protects us from all internal and external dangers; she provides us with all the necessary conditions for our spiritual training, and guides us and inspires us with her blessings as we progress along the spiritual path. These prayers include praises to the twenty-one manifestations of Tara. Because these are Sutra, the actual words of Buddha, they are particularly powerful and blessed. Usually held on the 8th of the month. Check calendar for exact date and time. This practice is a special Guru yoga of Je Tsongkhapa in conjunction with Highest Yoga Tantra. The main practice is meditation on reliance upon our Spiritual Guide, but it also includes all the essential practices of the stages of the path (Lamrim) and training the mind (Lojong), as well as both the generation and completion stages of Highest Yoga Tantra. By relying upon our Spiritual Guide as one with Je Tsongkhapa, our compassion, spiritual power, and especially our wisdom will naturally increase. 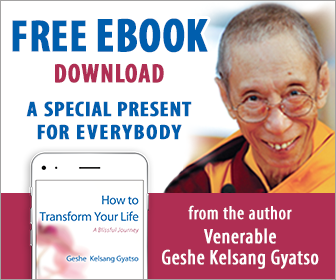 A complete commentary to this practice can be found in the book Great Treasury of Merit written by Venerable Geshe Kelsang Gyatso. Usually held on the 10th and 25th of the month . Check calendar for exact date and time. Through practising transference of consciousness, known as ‘powa’ with faith, compassion and concentration we can transfer the consciousness of those recently deceased to a higher rebirth or to the Pure Land of a Buddha. The Powa Ceremony can be done either by a group of practitioners or individually on behalf of one or more deceased persons, or countless deceased beings. By engaging in this practice we also create a great collection of virtue, which will also lead us into the pathway to a Buddha’s Pure Land. Usually held once a month . Check calendar for exact date and time. Dorje Shugden always helps, guides, and protects pure and faithful practitioners by granting blessings, increasing their wisdom, fulfilling their positive wishes and bestowing success on all their virtuous activities. It is used for fulfilling our heart commitment to practise Lamrim, Lojong and Mahamudra and to rely upon the Dharma Protector Dorje Shugden, regarding him as inseparable from our Spiritual Guide and Buddha, and for restoring any degenerate or broken commitments we may have incurred. Usually held on or near the 29th of the month. Check calendar for exact date and time. Medicine Buddha is a Buddha Doctor whose function is to release living beings from outer and inner sickness by bestowing blessings upon them. By relying upon Medicine Buddha sincerely, we can be cured of heavy physical and mental disease, find release from the internal pain of the three poisons – attachment, anger and ignorance – and receive protection from many other dangers and obstacles. Moreover, by practising theMedicine Buddha Sadhana sincerely, we receive a special power of body, speech and mind, which we can then use to help others through healing actions, as presented in this Medicine Buddha Prayer. Avalokiteshvara is an enlightened being who is a manifestation of all Buddhas’ compassion. By relying sincerely upon Avalokiteshvara, the Buddha of Compassion, and reciting his mantra with strong faith, temporarily we will improve our realizations of all the stages of the path, especially our realization of great compassion, and ultimately we will attain supreme Buddhahood in Avalokiteshvara’s Pure Land. This prayer focuses on the Four-armed aspect of Avalokiteshvara.